Дополнение: Бриллианты 34 шт. - 1.26 карата. Двойная раскладывающаяся застежка. Size:	Ladies Case Diameter:	36mm Case Thickness:	9mm Movement:	Quartz Case Material: Stainless Steel & Rose Gold Dial Color:	Green Bracelet/Strap:	Stainless Steel & Rose Gold Polished Clasp Type:	Hidden Folding Clasp Bezel:	Fixed Crystal:	Scratch Resistant Sapphire Case Back:	Solid Screw Down Crown:	No Water Resistant	50m/150ft Polished stainless steel case with rose gold center lugs. Polished stainless steel bracelet with 18kt rose gold center links. Bezel set with 34 diamonds weighing approxiamtely 1.26 carats. Each lugs end is set with a green Tourmaline Crown set with single green Tourmaline. Two tiered green dial: Outer/upper tier has a flat finish Center/lower tier has a delicately engraved embroidered pattern. Hour markers: Applied rose gold painted 12,3,6 & 9 Roman Numerals. Applied rose gold rimmed index with luminescent fill for the rest of the hour makers. Minute track on the the tapered edge between the two tiers of the dial. Rose gold dagger shaped hands with luminescent fill. Date Window located at the 3 o'clock position. 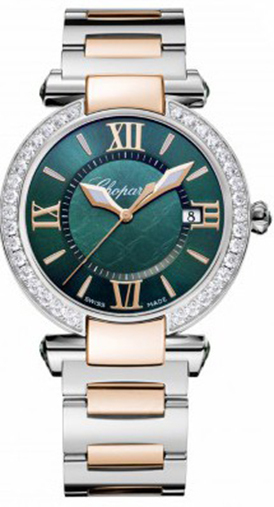 Есть вопросы по Chopard Imperiale 388532-6009?